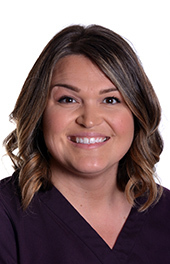 Hygienist Corrina Piercy joined La Clinica in 2012 and works at East Medford Dental Clinic. In 2007 she graduated from the Oregon Institute of Technology as a registered dental hygienist. Corrina is a native of Crescent City, Calif., and lives in Medford with her husband, Justin, and sons Devin and Jace. She enjoys camping, spending time with friends and family, cooking, and traveling. She came to La Clinica from a private dental practice.